They’re seemingly on every corner in North America. Identified as the most popular coffee house chain, Starbucks, like other big chains, is about business and the bottom line, its grassroots origins are notwithstanding. But, Starbucks has a secret that may influence where you buy your next cup o’ joe. Starbucks is a member of the Grocery Manufacturers Association (GMA). from genetically-engineered seeds and agricultural chemicals to dairy products and processed foods—including Coca-Cola, PepsiCo, General Mills, Nestlé, Del Monte, and more than 250 others. It is a very powerful lobby that influences how food is grown, packaged, marketed, and sold. In 2013, the state of Washington filed suit against the GMA for money laundering and fraud in the $70 million campaign against labeling foods that contain genetically-modified organisms (GMO). In 2007, Starbucks threw concerned consumers a very small bone by consciously and vocally removing the use of milk with Monsanto’s rBGH (growth hormone) in its beverages. They touted this act in an announcement that they were going GMO-free. However, the reality is not even close. its use of GMO is prevalent, from their milk (factory-farmed cows are fed GMO corn and soy) to its sandwiches and baked goods. But they don’t tell you that. However, if you click on nutritional information listings on the Starbucks website, the nutritional analyses are listed, but not the ingredients (1). Plus, on one page, they say there’s no trans fat in their products but in the nutritional breakdown, there are. This means that customers have no idea what’s in their stuff. The GMA has successfully blocked GMO-labeling legislation in more than 30 states, with a cost of countless millions of dollars. One of its arguments against GMO labeling is the cost of producing new labels. That’s truly funny, considering all the money spent to prevent their requirement. Vermont is a trailblazer in its quest to make GMO labeling mandatory. A legislation was passed there (Act 120) that went into effect in July 2016. GMA, the Snack Food Association, the International Dairy Foods Association, and the National Association of Manufacturers filed suit against the state of Vermont shortly after the legislation passed (2). Grounds for the suit are the facts that the U.S. governmental agencies that regulate food have deemed GMO safe and the Act is “compelling manufacturers to convey messages they do not want to convey”. The consumer advocacy group SumOfUs has collected almost a quarter of a million dollars from its donors for the Vermont legal defense fund. “There’s much more at stake here than just whether GMO foods will be labeled in a single U.S. state. Vermont is the very first state in the U.S. to require labeling. Dozens of other states have said that they will follow this path — in order to encourage this, we need to ensure that Vermont’s law stands strong. By way of membership in GMA and shady but cute marketing, Starbucks is masking its GMO use and pro-GMO position. Starbucks is in bed with Monsanto, DuPont, Coca-Cola, and all the other mega-corporations who manipulate and pollute our food. 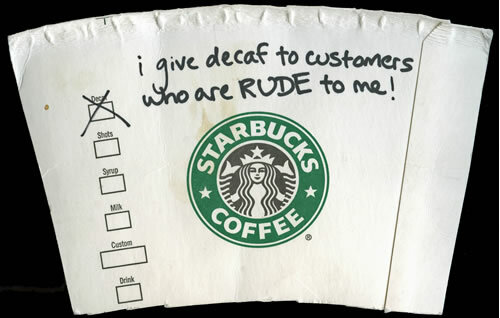 In addition to its use of GMO food ingredients, Starbucks’ boasting social responsibility and sustainability is a joke. Starbucks outlets use single-use paper and plastic cups for its gazillions of beverages but calls itself” “committed to significantly reducing the waste our stores generate… In many of our stores, we recycle at least one type of waste”(4). A petition sponsored by the consumer group Food Democracy Now urges the CEO of Starbucks to stop using GMO milk at all Starbucks locations. It mentions Starbucks’ marketing claims and challenges the corporation to walk the talk. All this is part of the agenda of Big Food, Big Ag, Big Pharma, and all the other Biggies to misinform, mislead, and infringe on consumers’ right to know and have control over what they buy. If you’re curious and want to known more, watch a clip from the film “Bought” here that discloses and discusses these issues. There’s a Starbucks on every corner because people buy what they sell. just walk down the block to a local coffee shop instead of getting your Frappuccino.